The venue is pretty huge, with a semi-industrial vibe, but they don’t lay it on with a trowel like some other places I could mention. 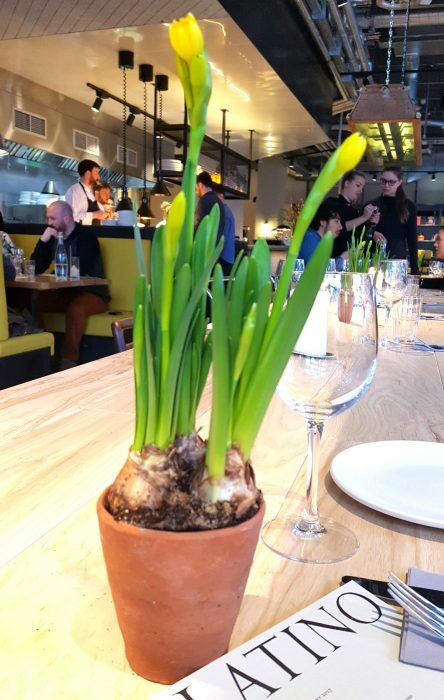 There is colour from the booth cushions and sprightly little daffodils on the tables, and it works. I’m not sure it would do cosy and romantic as well as a fab slap-up group meal, but either way it’s a not-to-be-missed. Ian and I popped along on a Saturday lunchtime to meet my friend Adam, one of the ace team behind the venue. It’s really helpful to have someone to make recommendations when it’s a new venue and there aren’t many reviews around, but to be honest everything sounded so good that we could’ve just pointed with our eyes closed and it would’ve been an equally good meal. (Also it’s key for me to be clear that there were 3 of us, due to the volume of food that is evident in the pics). 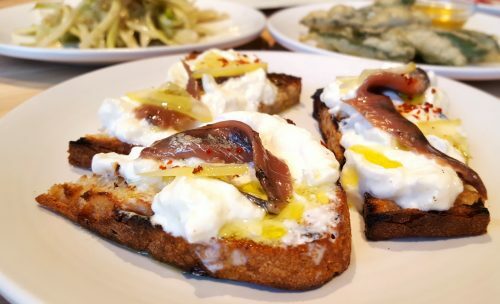 We kicked off with some antipasti, namely anchovy and stracciatella on toast, fried sage leaves with honey vinegar, some cured meats and a puntarelle salad. 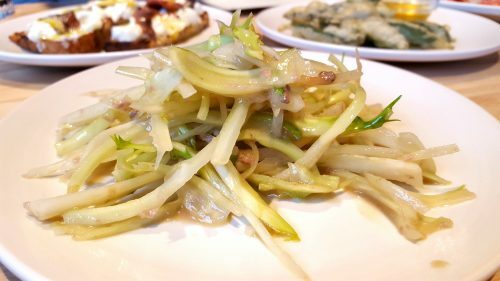 Puntarelle is a salad leaf similar to chicory, with a slightly bitter flavour and crunchy texture. It only really grows in Rome, and has quite a short season (November to February at best), so when it’s around Romans go nuts for it. It was lovely here, really simple with an anchovy and vinegar dressing. 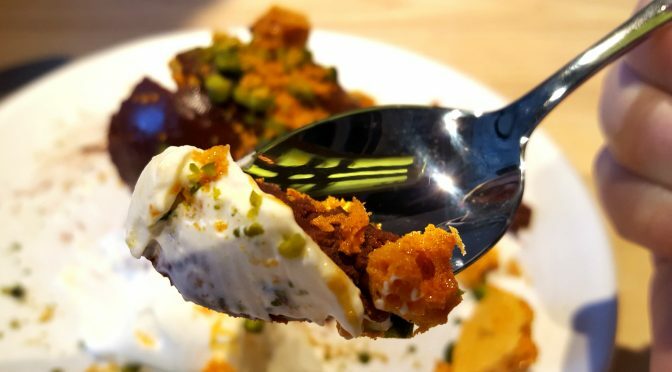 (No point banging on about the stracciatella – suffice to say I promptly ordered a second plate of it immediately after finishing). 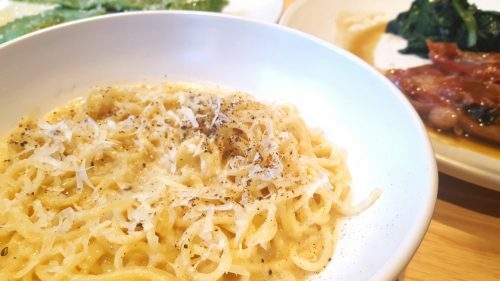 Lovely creamy, peppery sauce with light tonnarelli (long, spaghetti-like strands), seems simple but God knows how they make that sauce so good. A definite rival of the Padella version. 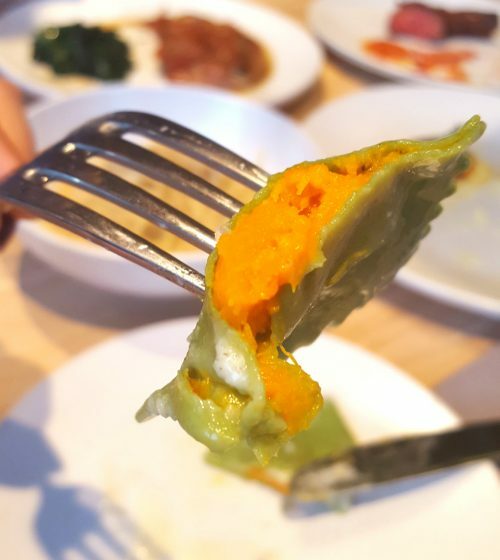 Vivid spinach pasta filled with sweet, soft butternut squash. 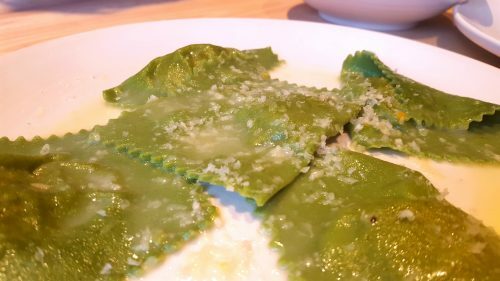 Such thin pasta in perfect parcels. Forget what you think gnocchi is. 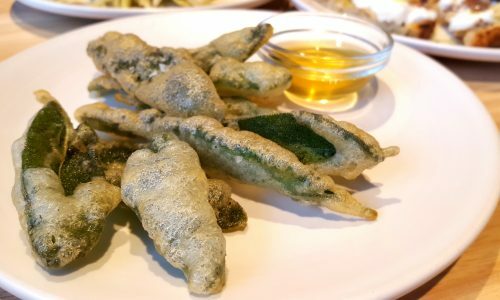 These are big, pillowy flump-esque things, soft in the middle, beautifully browned and covered in brown butter and sage. A definite highlight. The onglet (hanger steak) with salsa rossa picante was rare and while not super-tender like fillet etc, the flavour was immense. The cut is from the diaphragm, so picks of some offal-y flavour, making it ideal for a strong sauce. 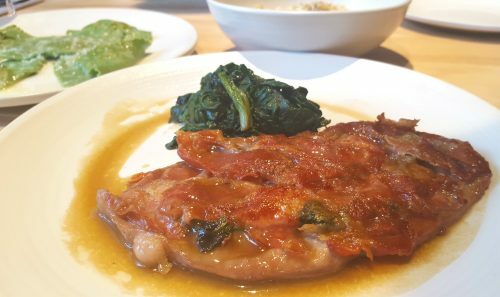 Saltimbocca is one of my faves, and this one lived up to all my dreams. The sage whacked you round the face (as Greg Wallace might say) and the meat was tender and gorge. 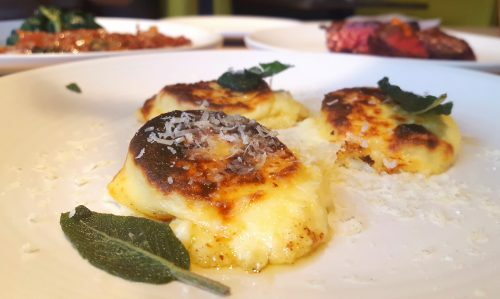 I covered all of the above in the most divine wet polenta, heaving with parmesan and butter. I am off to the gym in a bit. 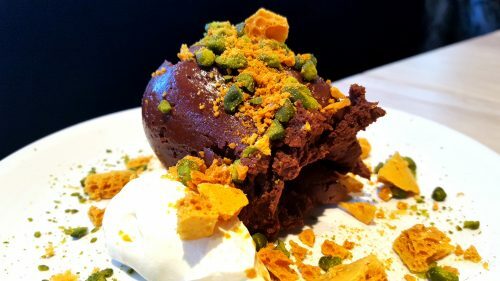 Although stuffed we powered through, and on Adam’s recommendation went for the minimally-named Chocolate, pistachio and honeycomb. Well, the name is the only thing that is minimal, trust me. The thing is huge, a massive ball of ganache covered in freshly made honeycomb and pistachios for texture. It came with a blob of creme fraiche (I think?) which really balanced it with a bit of acidity. Spectacularly delicious and indulgent. This is definitely one to share. 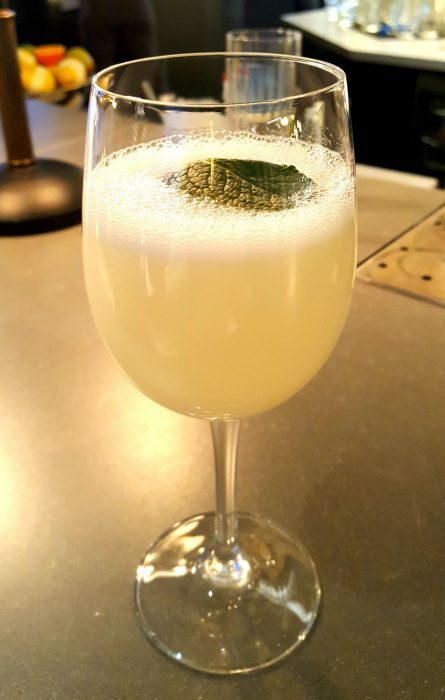 On the cocktail side, this was my fave – lemon sorbet, vodka and prosecco, blended in the exact commercial blender that I’m gagging to have in my kitchen. This is super-refreshing and really light. I could’ve had a few more, but was almost time to be rolling home at this point. 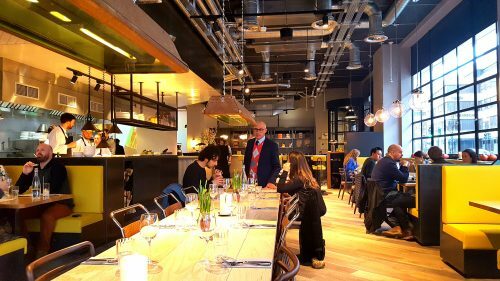 Palatino is in soft launch this week, with 50% off food. Have a look here for more info. Palatino, 71 Central Street, EC1V 8AB.